DJI Zenmuse H3-3D V1.1 Brushless Gimbal Phantom 2. The DJI Zenmuse H3-3D gimbal requires no additional manual adjustments, there is no need to adjust the C.G. 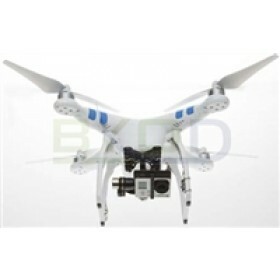 or parameters in the software for use with the Phantom 2, the installation process is extremely simple, there is no need to add the V2 PMU and GCU inside the Phantom shell, these two items are built in, so no soldering required into the system, the installation is plug-and-play. 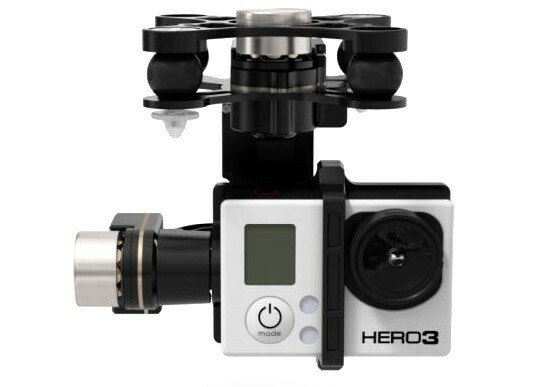 The H3-3D gimbal has a video output pickup from the GoPro Hero3’s rear connector and with the use of video transmission (video downlink required) you will be able to view the image seen by the GoPro in real time. DJI are looking to add the use of remote start/stop shooting etc of the GoPro Hero3 in future firmware upgrades. 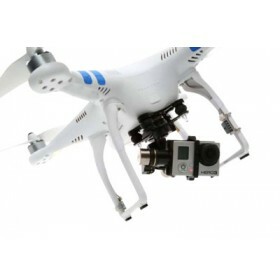 The mechanical design, weight and power supply of the gimbal is matched to the Phantom 2 perfectly. The Phantom transmitter can be used to give the pitch (tilt) control function to the gimbal, the other 2 axis's are not user controlled. No additional receiver channels are needed as it just uses the additional MC channels for operation. The aluminum alloy material and mechanical design means that the gimbal is extremely light weight (total approx weight 330g with the GoPro Hero3 included). The structural design of the aluminum frame guarantees the strength of the gimbal and gives it a robust feel and function. DJI Zenmuse H3-3D Brushles Gimbal as it comes supplied with the additional parts required to add the gimbal to the CAN system. Please see my youtube video for a full demo of the unboxing, install and demo of just how fantastic this piece of kit is!